I like Rohan Sippy’s (director) style of filmmaking… whether it’s Bluffmaster or Dum Maaro Dum (I am going to ignore Kuch Na Kaho as a debutante’s mistake); he brings that effortless style to his cinema, which is the USP of Dum Maaro Dum. 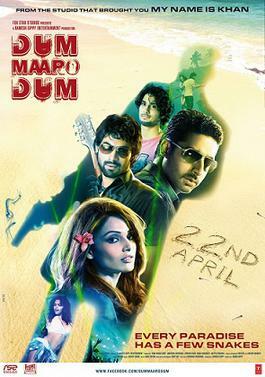 With an impressive ensemble cast, uber stylish look and no other decent Bollywood flick for over two months, Dum Maaro Dum had everything going for it. The film obviously opened well and thankfully is not a damp squib. It has what it takes to be a decent entertainer but that’s about it; it does not wow or blow your mind, it is a good time-pass affair at the most. I will come to the story and acting later but will talk about the film’s style that makes it what it is. Starting from the teaser poster with Deepika Padukone’s tattooed waist to the well cut first promo; the film looked stunning (only Dabangg promos looked as exciting before this one). Well done the production design team (CROP) and the art director, Shazia Zahid Iqbal; you nailed it! There were some cool lines in the film that were funny and extremely smart (dialogue, Charudutt Acharya)… Styling by Falguni Thakore was a little over the top at places, especially with the women but nothing really to complain about; they all looked good (with the exception of Aditya Pancholi who is so 90s and didn’t fit in this stylish flick). The camera work by Amit Roy was great and he managed to give the film a feel that suits the title. All good, except a few places where they over did it… like in the song ‘Thayn Thayn’, which may have appeared cool to the makers but could have been done away with. Similarly, the much talked about title track with Deepika (she never looked better) had some stunning moments that were ruined by tacky lyrics (Jaideep Sahni you are way too good to dole out such stuff). The background score was quite nice and the original Dum Maaro Dum (from Hare Rama Hare Krishna, 1971) guitar riff was incorporated well; kudos to Midival Punditz and Karsh Kale. Otherwise, the original music by Pritam was below average and most songs could’ve been done away with. Coming to the screenplay, it is the strength as well as the weakness of the film. Shridhar Raghavan mounts a great plot that reminds you of Nat Geo’s Jailed Abroad as well as Bolly-thrillers of the 70s. Till the interval, the film moves at a breakneck pace and then falters, only to come back with a killer twist (in true Raghavan style, remember Khakee), which I really believe could have been handled better by the director and the editor (Aarif Shaikh). Performance wise, it is the return vehicle for Abhishek Bachchan who is very convincing as Kamath, a fearless cop on a mission to get Goa rid of the drug mafia. Bipasha Basu as Zoe fits the bill but doesn’t shine; how I wish Zeenat Aman was younger enough to do this role. Aditya Pancholi as Biscuita (yes, you read it right) is ok but we could have done with a much smarter and meaner baddie here (think Ajay Devgn in a meatier role). Prateik Babbar aka Lorry is brilliant as a young, innocent guy stuck in the drug trafficking mess. He is an actor to watch out for as he is able to comfortably change basis the character. Finally, Rana Daggubati, the Telegu film-star who made his Bolly-debut with this film… he is good and the girls seem to love him; guess a star is born.